Do you know what September is? It's the month of creepy crawlies. Trying to get into my car (yes, the mice are back) and into my house (wolf spiders...shudder!) and into my compost bin (very large brown larvae - is this bad?). And let us not forget, the most dreaded of all, those stinkin' stinkbugs! All these creepy crawlies were on my mind when I made breakfast for the boys the other day. For more Muffin Tin Monday ideas, check out Muffin Tin Mom. Very cute breakfast! I am always amazed at folks who buy the "fake" spiderwebs to decorate their windows and doors for Halloween! We have plenty of webs naturally! So cute! Love the house. Maybe your spider will get big enough to catch the mice! I seldom kill a spider and the garden is full of those huge ones that live on the ground and haul their egg sack with them. I can only imagine how many bugs they are eating, good girls! You must be a food artist, I used to make faces with the mustard and ketchup but that was the extent of it. boo for the bugs and creepy crawlies, but the breakfast came out great! Spiders are everywhere.. In my basement it looked like a haunted house so I took my broom down and swiped those webs and then sprayed my whole basement.. Sorry..they are all in spider heaven~! Pretty funny, those big spiders can catch you off guard. What an original idea for breakfast; no wonder the boys loved it! i'm laughing at your wolfies. we had a plethora of them this summer. Wolf spiders don't sound very nice to me. I think they are an American speciality oh and probably else where too we certainly don't have them here not by that name anyway. I just found a few were seen in Scotland in 2004. Ugly,nasty little chaps. Love the breakfast--you are so imaginative and creative! I hope he eats the stink bugs and someone will come eat him. The meal looks great. It is getting to be that creepy crawly time of year.... I can't believe that we are getting close to October and then Halloween. Oh, this post gave me the creeps! 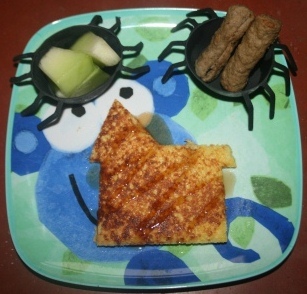 Super cute breakfast, but eek...good luck with that spider! This looks very cute. Know that these creatures can be a bit creepy. Enjoy your day! You put the fun in food with that meal. Love the silicone spiders, not so much the real things! We had an issue with June bugs last Spring...it was disgusting. bleh. I hate creepy crawlies. Oh the stinkbugs! I remember your trials with them last year-and wolf spiders make me shudder too. Here, August is hobo spider season. They are the biggest spiders I have ever seen and they terrify me! your presentation makes eating even more fun!! EEEEK! Fake or not...I could not eat with spiders on my plate. I really don't like spiders. Blech. I read your responses to A Rural Journal's questions and had to hop over to your blog! Squash bugs- I have come to like them. Strangely enough I enjoy trapping them on duct tape bracelets when I turn over my spaghetti squash leaves. I spent the entire summer doing this. I sort of miss it now. I guess squash bugs are different than stink bugs, but they sure look similar. Never thought I'd use the word "cute" to describe a breakfast, but it is! Oh no!!! be very careful of that creepy spider! That is so cute. I love the spider cups. Neat idea for a breakfast. We had mice a bit ago, but I think we finally got rid of them all. We have spiders, thankfully not wolf spiders. I really don't like wolf spiders! I am always wishing they would find some other place to live besides under my home. Mice are ok so far this year our three cats keep them pretty much out of our house. Now I want to see a photo of that spider you wrote about. When I lived in Shavannah, GA they had some huge spiders as well. I've never seen anything like them in Omaha, NE. To this day I do not know what kind they were. I was scared because I didn't have health insurance at the time. Such a cute plate! I can see why he gobbled it all down. I hate September for that reason and I wish I didn't. The weather is more my style but because it's when the creepy crawlers I dread most seem to be out, I stay out of nature as much as possible until I know they've gone into their cocoons.